In Denmark we have a special type of bar called a Bodega. A bodega is dark, has tinted windows and is frequented primarily by old drunks. You can smoke in a bodega and the beer is cheap! Most bodegas are empty during day except for a handful of regulars, but come to life at night with young people coming in, in search of indoor smoking and cheap drinks. 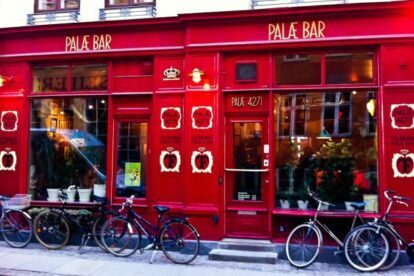 Palæ Bar is an upscale bodega. It is located on an expensive address and it shows in the clientele. You’ll find old retired lawyers, architects and doctors alongside artists and journalists. The average age is well above 50 but it lends an informal air to the place. People play chess, discuss jazz and politics and in general just enjoy life over a beer or a glass of rose wine. A simple lunch is served every day, as Palæ Bar gets a big order of Smørrebrød (the infamous danish open-faced sandwich) delivered from a local take-out place. It is served for lunch as long as they last, and if you are really lucky, there might be a piece or two left later in the evening as well. Every 3 weeks on Sundays there is live jazz. On sunny evenings quite a crowd can gather on the sidewalk outside enjoying the last rays of the day. Not a bad place to spend an evening.